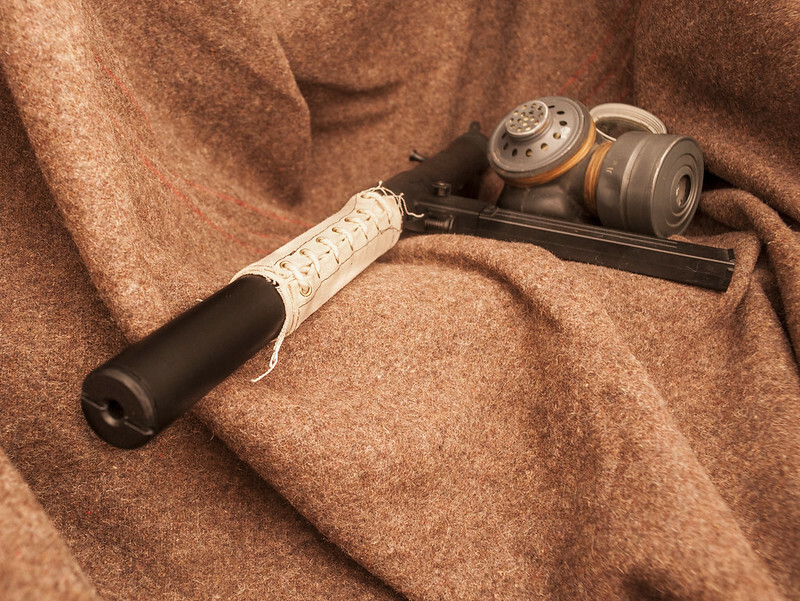 I realised the other day that I hadn’t updated my Sten Suppressor pictures in about two years, in spite of making this much nicer model for some time. This replica can be used correctly on the MkII and Mk5 Stens, the latter format would make it a Mk6 if you were so inclined. I’m using a thicker canvas for the cover than before and a thick cotton cord, ready laced up in the correct format (straight laced, like British Army boots). 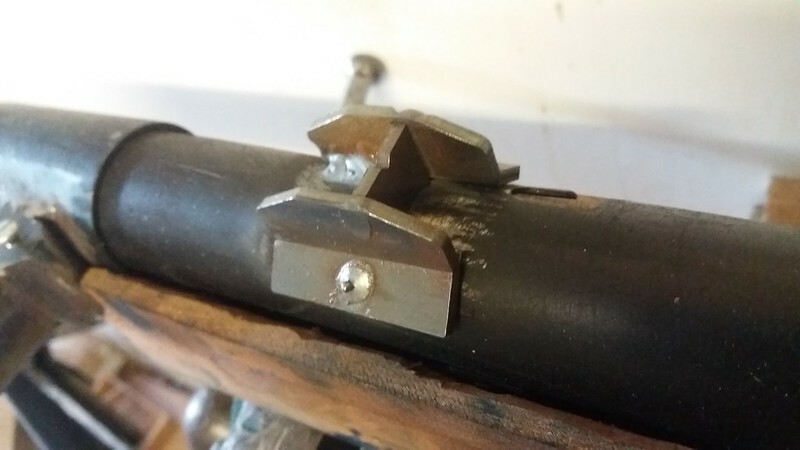 A securing screw locks it into place on the barrel. The front cap is made from cast rubber. If you want a suppressor of your own, you can buy it here. Don’t forget you can buy many of our smaller items via Etsy. Our larger items can be found here. 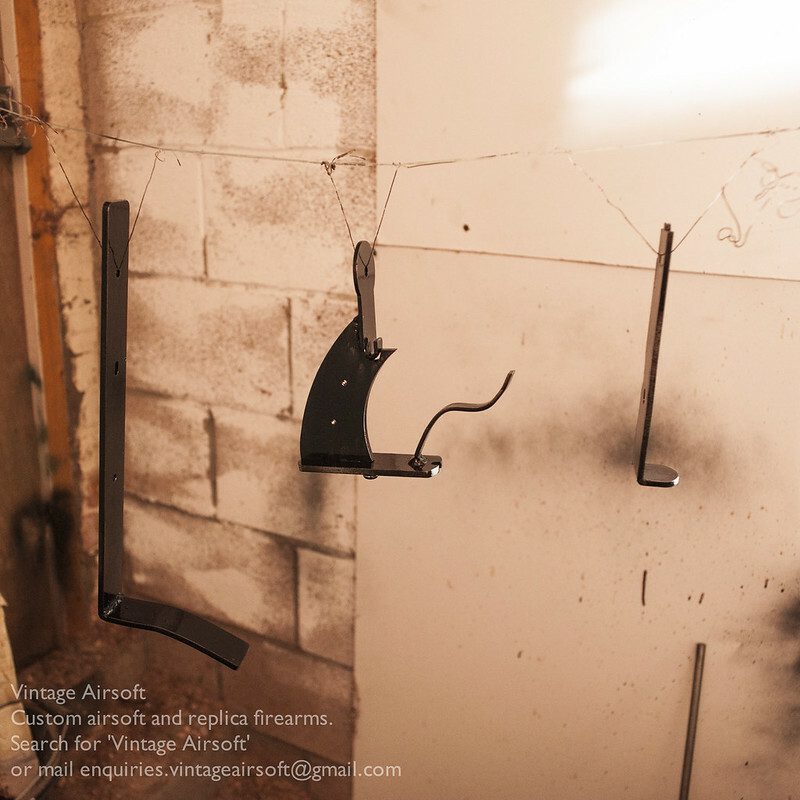 If you have an idea of your own, drop us a line on enquiries.vintageairsoft@gmail.com to discuss. ‘Like’ our Facebook page or follow the blog to get regular updates on projects and interesting videos and articles. 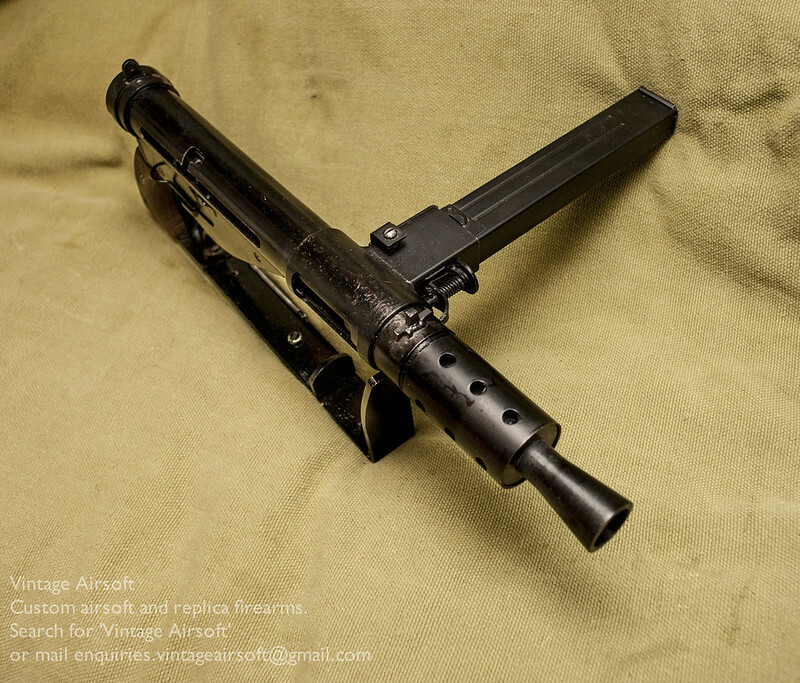 The Sten MkIV has very little written on it, so this introduction will be rather short. 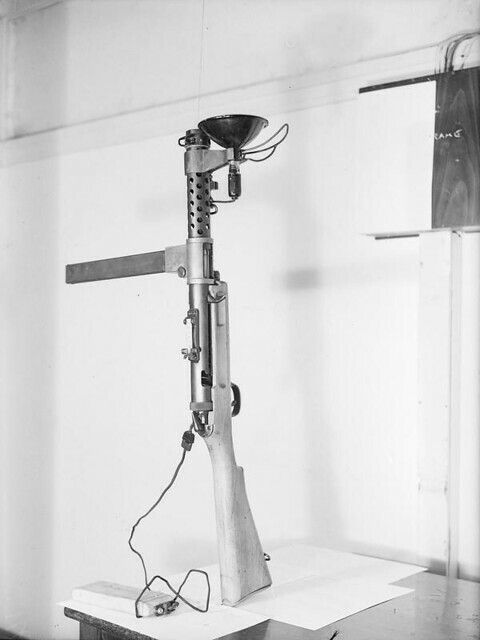 It was an experimental design to make Britain’s Sub machine gun more compact. This has several possible reasons, but the most likely seeming to my eye (lacking access to original documents) is the Airborne theory. 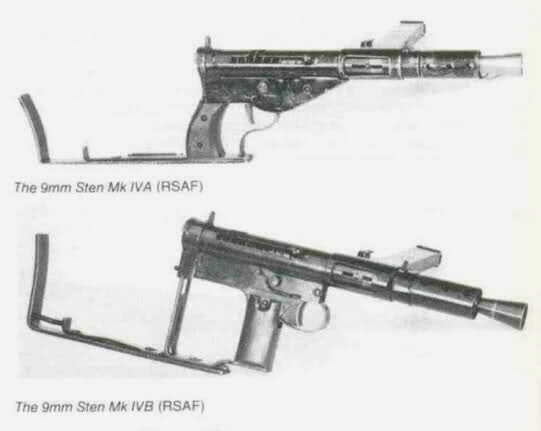 A more compact sub-machine gun than the standard Sten MkII and MkII would make sense for airborne troops and this definitely meets that requirement. 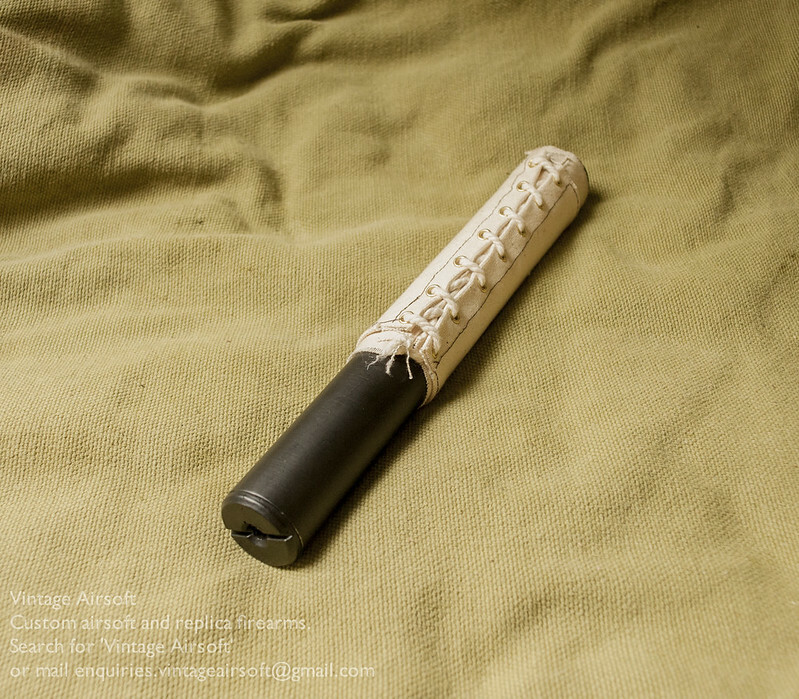 This was ultimately met by the Mk5, which could have its buttstock removed and replaced with a blank backplate. 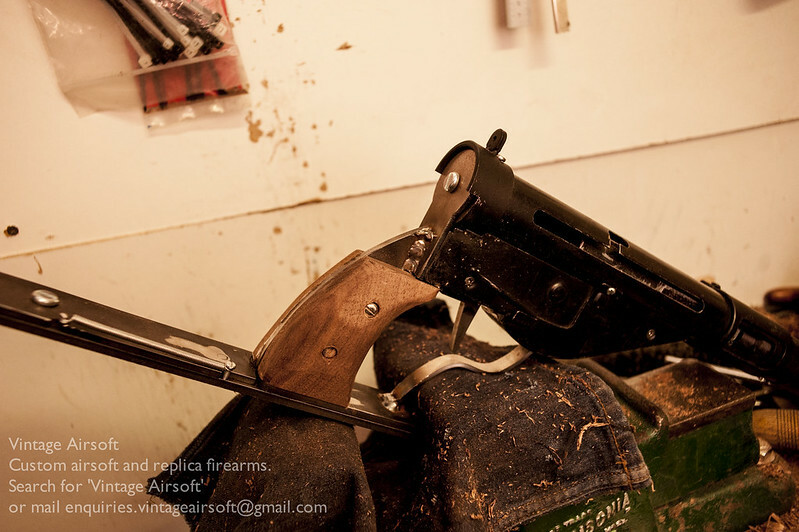 There were two versions of the MkIV, the ‘A’ which had a hand guard style trigger guard (some say to accommodate arctic mittens) and the ‘B’ which has the trigger and pistol grip advanced to halfway down the receiver. This was apparently an improvement but not enough it would seem! The reason the MkIV was rejected during trials was that it was ‘uncomfortable to fire’. This does seem a little bit ironic seeing it was designed to replace the ergonomics-violating MkII and MkIIIs, but judging by what was eventually adopted the general effort was towards a significantly better gun comfort wise rather than a slight improvement. The other possibility is that, being much smaller in the body than a ‘normal’ Sten (especially in the barrel) the recoil, muzzle blast or ejection may have been pretty bad. It’s pretty much impossible to say without access to trials reports or getting to fire the (so far as I can tell) only remaining piece at the Royal Armouries. I suspect it will grow legs and walk out before I am allowed to do that however! 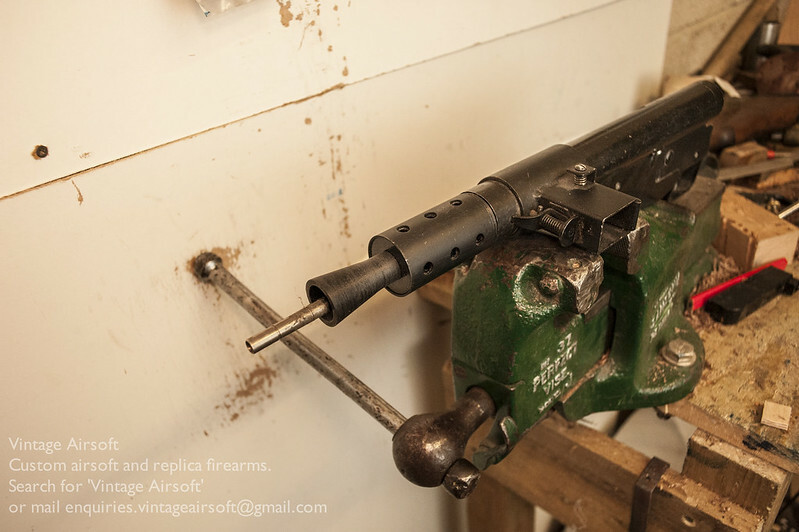 I’ll be making a MkIVa replica based on the example in the Royal Armouries, as a bit of change of scene from the bolt actions and machine guns I’ve been building a lot lately! You can see the build and completed item here. You can see more Sten projects here. P.S. : Bonus photo of a suppressed MkIVa apparently in the NFC, Leeds. 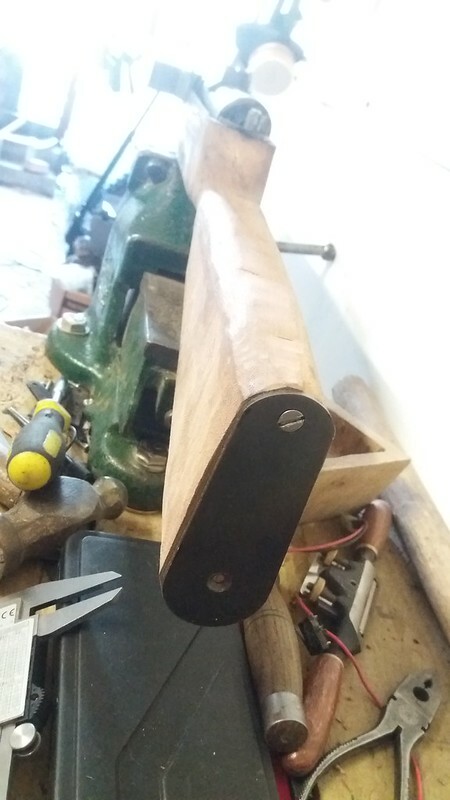 First things first, I draw out the stock template on the wood. 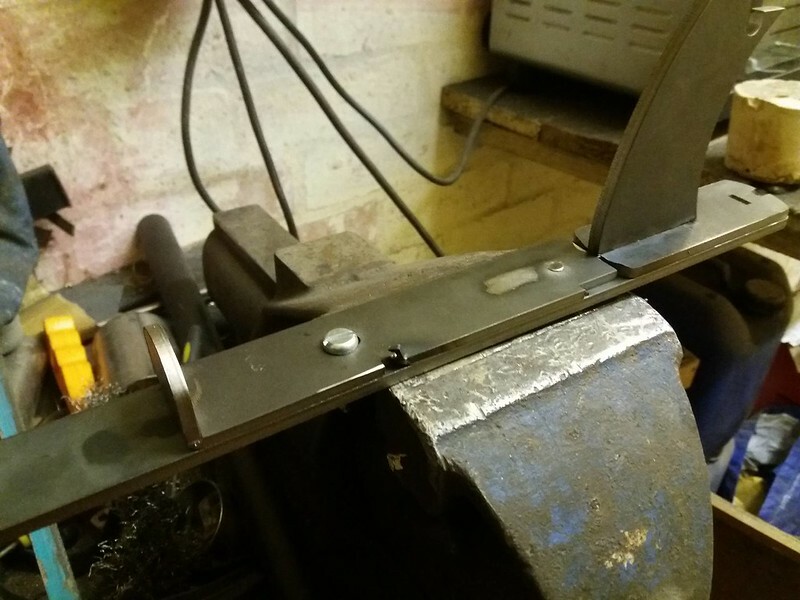 Over in the metalshop, I bent, tacked and welded the steel parts together. 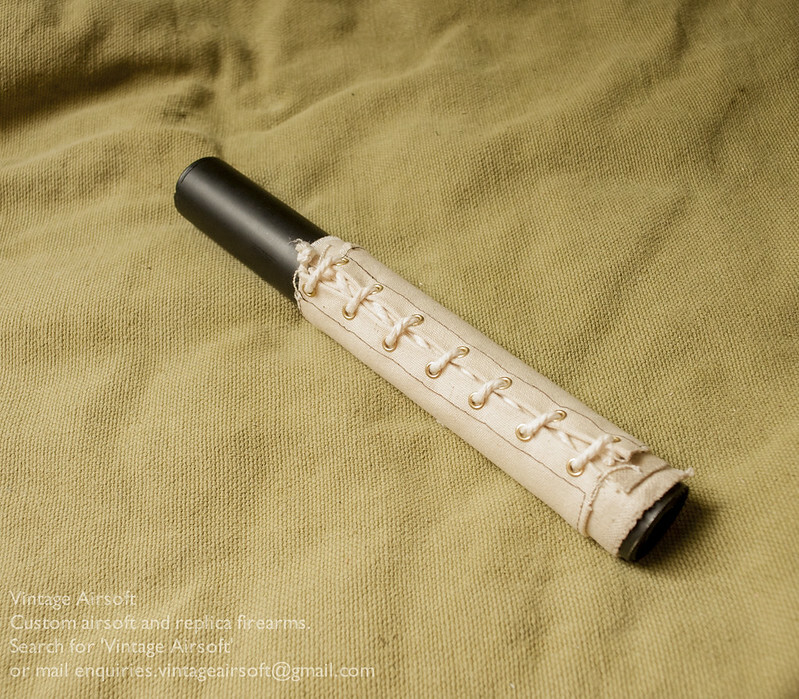 On this build I am making a new magwell, but will be using the original magwell sleeve. The fore-end of the Lanchester, showing the foresight and sight guards. These will need to be hardened to be much use I think. 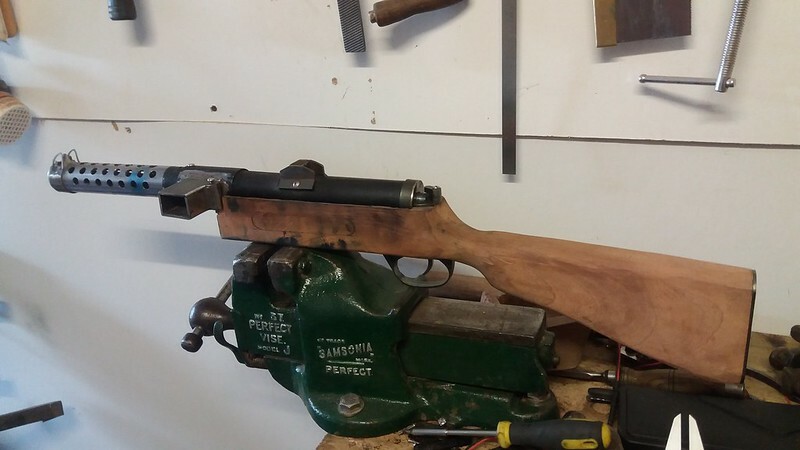 Fitting the action to the stock. This is always a long job, but having recently got a hold of some lovely blue oil paint I’m improving my fitting technique and speed quite a lot! Showing the bottom plate, which I am going to draw around to cut a nice, deep recess for. 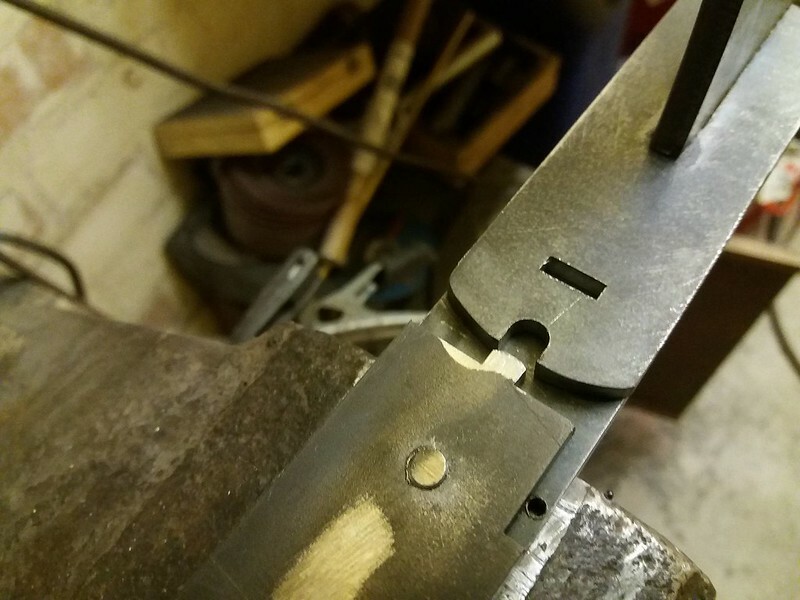 I have cut the recess for the bottom plate deep so that the trigger reaches through to the correct depth in the trigger guard. I may need to tweak the trigger design though as at present it is a bit sticky. Far from ideal in an automatic airsoft gun! 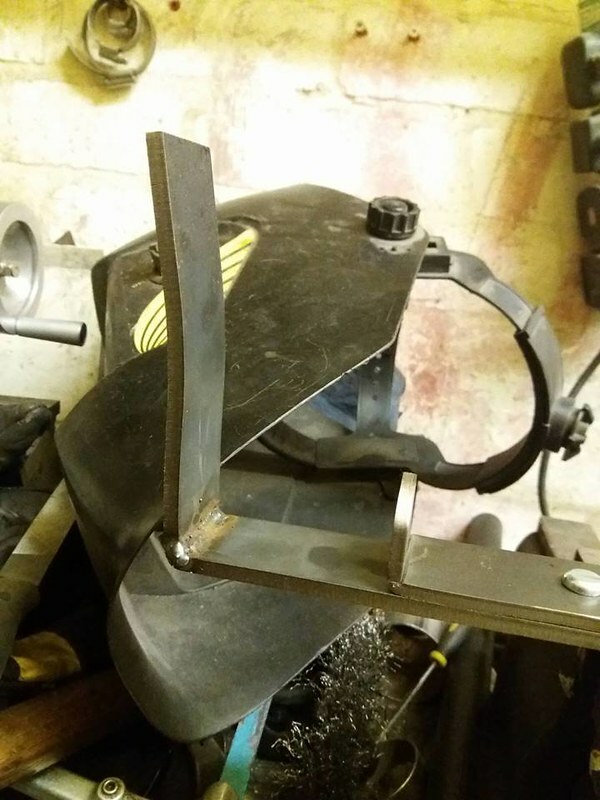 I can finally get to my favourite bit: Shaping the stock. 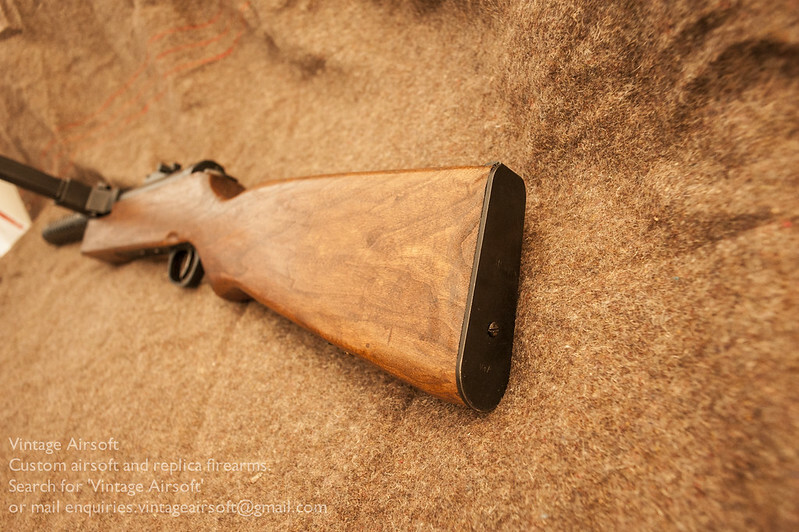 The Lanchester has a very slim, feminine wrist on the stock reminiscent of a P14/17 rifle. As a result it will have to rely on Lipos in the back of the receiver which is unfortunate but better than sacrificing the stock strength at the weakest point further. Even when I have carefully selected the grain to flow down through this for maximum strength there’s only so much you can do to keep it strong. The Lanchester, pretty much roughed out. Now onto the rear sight, locking lugs and detailing! During the stalemate of the Great War, both sides took to the laboratory to try and get an edge on the battlefield and level the massive attack/defence discrepancy in their favour. To this end each side ended up using to varying degrees: tanks, poison gas, aerial bombardment, advanced artillery spotting, mining, aerial reconnaissance, indirect machine gun fire, mortars… the list is pretty endless. One area that was somewhat neglected in spite of its potential was small arms development. Repeating, smokeless rifles were still a relatively new thing, and commanders expected to make use of them in a similar way to the way they were used in the colonies. Blocks of men firing into an attacking force while the attacking force tried to get close enough to shoot back. Unfortunately this idea was put paid to by the enemy having very similar ballistic capabilities and ability to hit targets at quite the same ranges. Although massed rifle fire at range did play something of a part in the early days of the war, especially at Mons and in the defence of Paris when both sides ground to a halt and entrenchment began volley fire became almost useless. Of course in defence soldiers would line up on the parapet and shoot those missed by the machine guns but once the enemy was in the trench, your rifle that could shoot accurately somewhat further than you could see with the naked eye was only useful when you spun it round and used it as a club. What soldiers needed was something with a high rate of fire that could deal with the high number of targets at close quarters experienced in trench conditions that didn’t necessarily have the range of a full rifle cartridge and certainly didn’t come with the weight of a typical machine gun of the era. There were ready-made options. DWM already produced a carbine Luger with the infamous ‘trommel’ magazine for the German Army and a shorter Luger that could be fitted with a stock for the Navy. 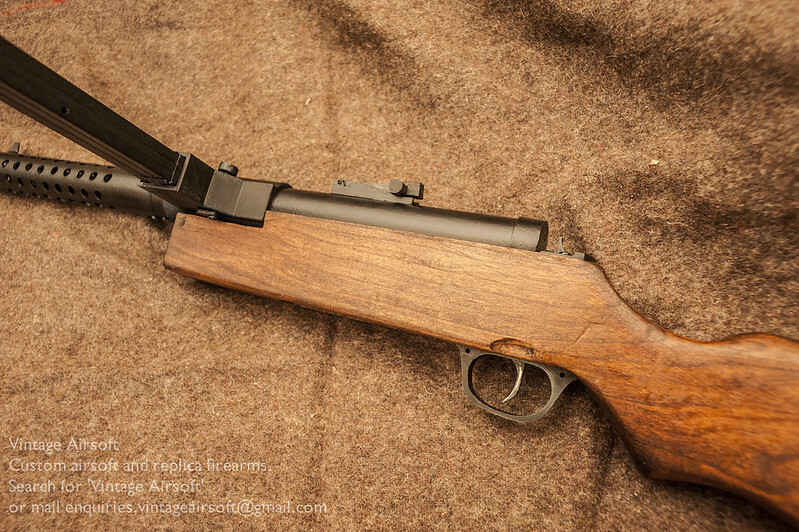 Mauser produced the C96 for both the Austrians and the Germans and was used internationally. This frankly was much better with a stock used as a carbine than as a pistol. Mannlicher had designed a carbine that, although it looks very C96-esque, operates differently and used a very early form of intermediate cartridge. These were never produced in large numbers and as far as I know never saw service anywhere. Thus the MP18/I was born. 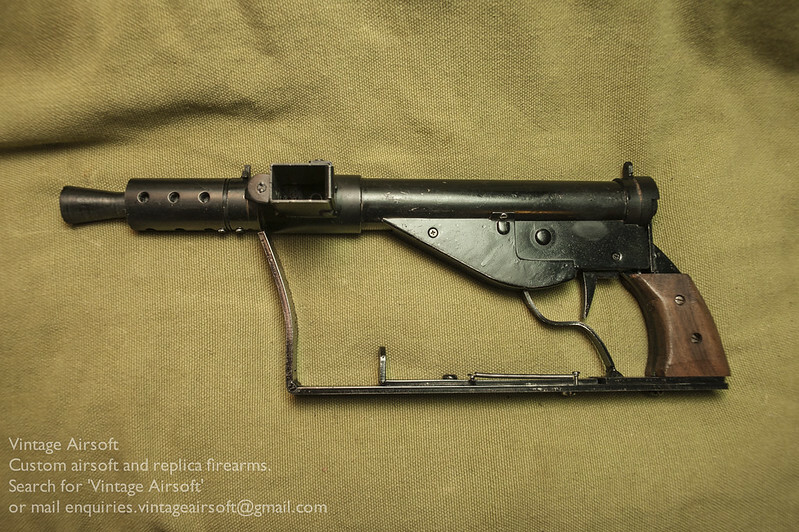 This is the first dedicated infantry sub-machine gun, though some will cite other early SMGs, the MP18 was the only one widely used and issued in WWI, anything else used at this point really only featured as a footnote in the fighting. It saw extensive use in the Spring Offensive of 1918, where the Germans took huge (in WWI terms) swathes of territory, exhausting their country’s war effort in the process. Post-war, MP18s saw use in the Weimar Republic, especially in urban fighting between the German State, Freikorps and the German Red Army during various uprisings in Munich, Berlin, the Ruhr, Saxony and Hamburg. There was a good deal of rebellion and fighting, especially in the inner cities in between various political factions. 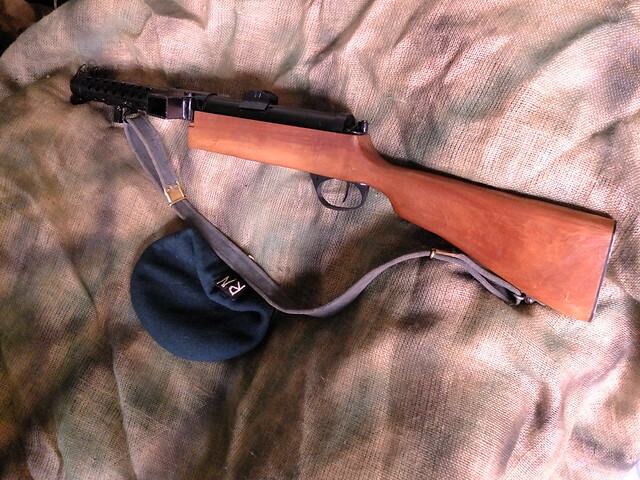 During this time, the MP18 saw extensive use, showing a distinct superiority over conventional rifles and pistols in close quarter urban fighting. Around the same time, these submachineguns saw use in South America, China and the Spanish Civil War. These things really got about. During the early Weimar Republic, MP18s underwent some improvements: the Government took existing MP18s and modified the magazine wells to take stick magazines rather than Luger magazines and drums. During this later service they were issued with 20, 30 and 50 round magazines. There were also many licensed and unlicensed versions produced, with SIG and Haenel (under Schmeisser) each producing their own versions. 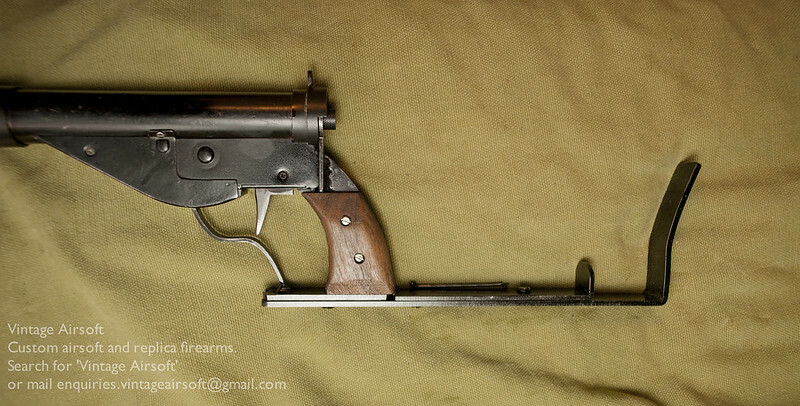 Haenel developed it into the MP28 which the Spanish copied, having converted it to 9mm Largo. 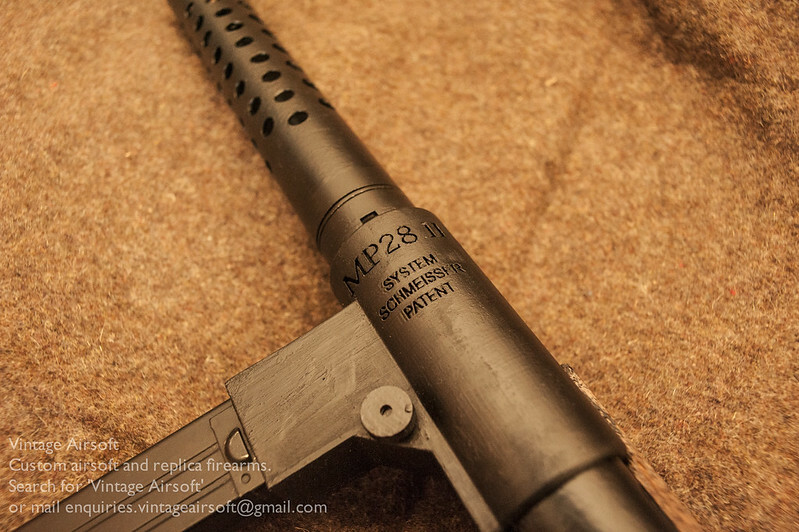 There are dozens of descendants of the MP18, the most significant are the MP34, MP28, Sten and the Lanchester. 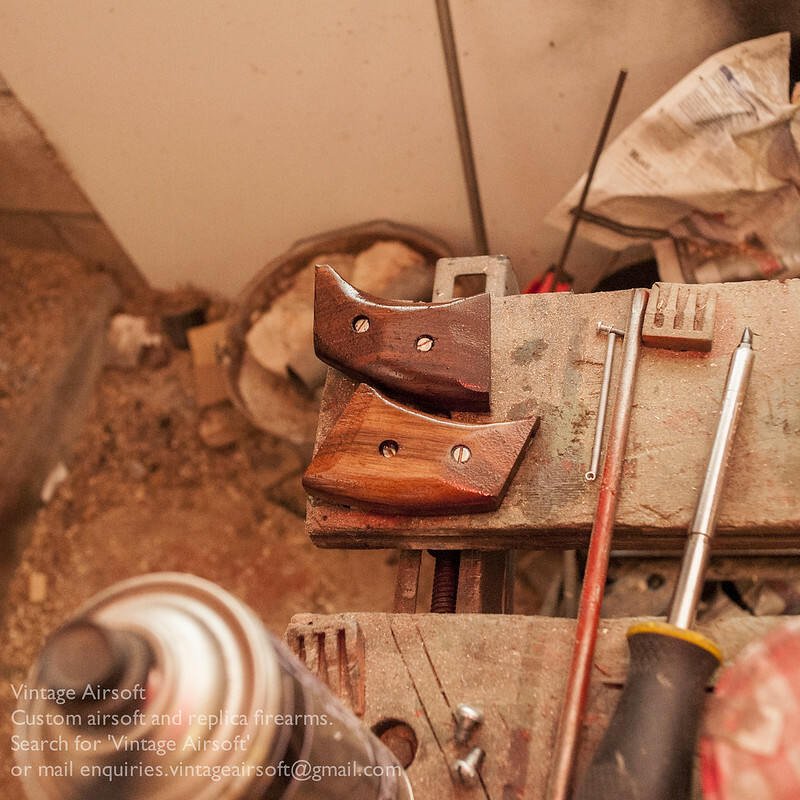 These and their relatives were used internationally all through the late 20th century. 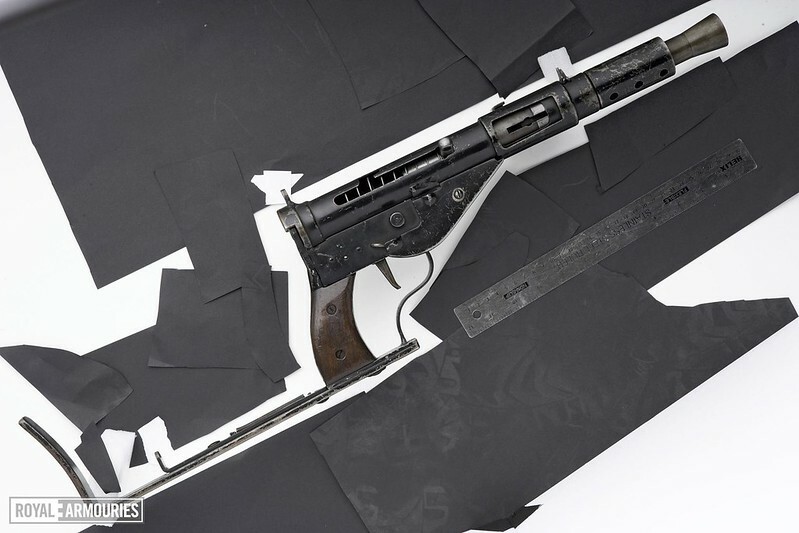 Although the open bolt submachine gun has fallen out of popular use with militaries and police forces, due to so many being produced you will still find descendants of the MP18 still in service in some parts of the world. *This said, the Imperial Army did experiment with a form of the C96 with detachable 40 round magazines. Few were produced, very few survive today. 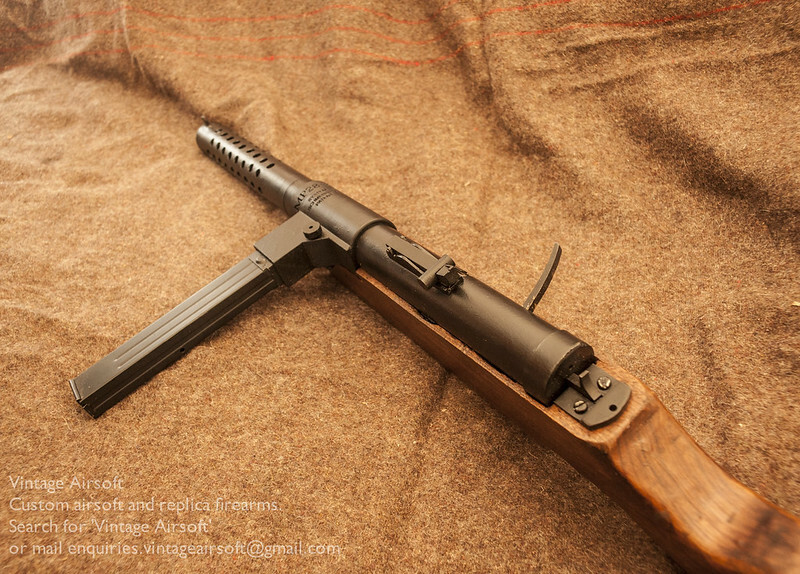 MP18 (type two): An MP18 in all respects except that the magazine well has been changed out to take a straight magazine. These should also have ‘1920’ stamped on the magazine well and on the receiver. MP28/II: An MP18 but with perpendicular magazine well, box magazines and either the MP18 or a straight, tapered op handle with a ball end. Adjustable tangent rear sight. 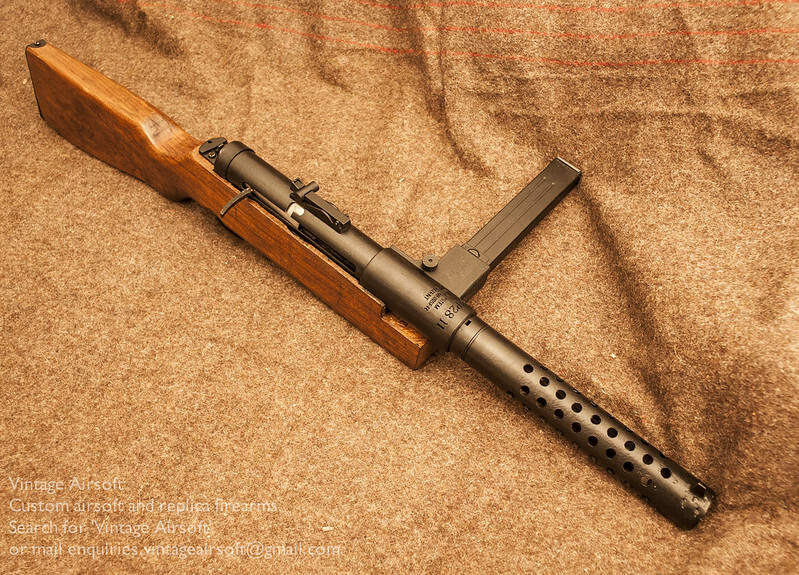 Mitraillette 34: An MP28 made in Belgium. Cannot find pictures but expect Belgian markings and proofs. 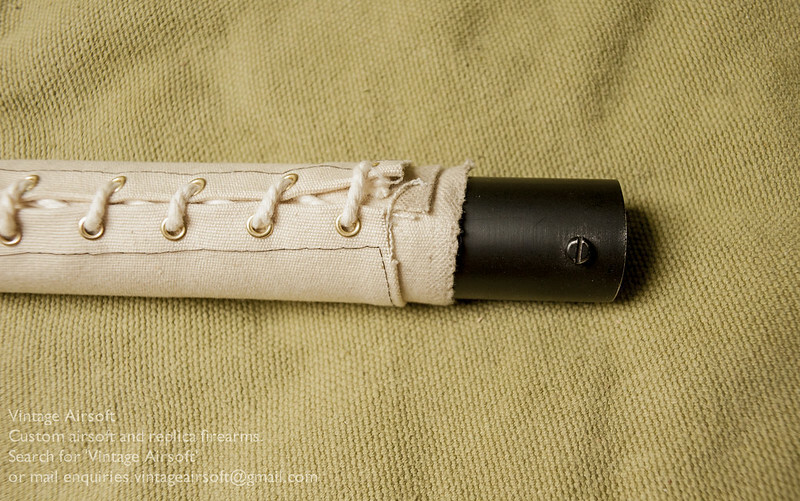 Sig Bergmann 1920: Rounded Op handle, with bead on end. 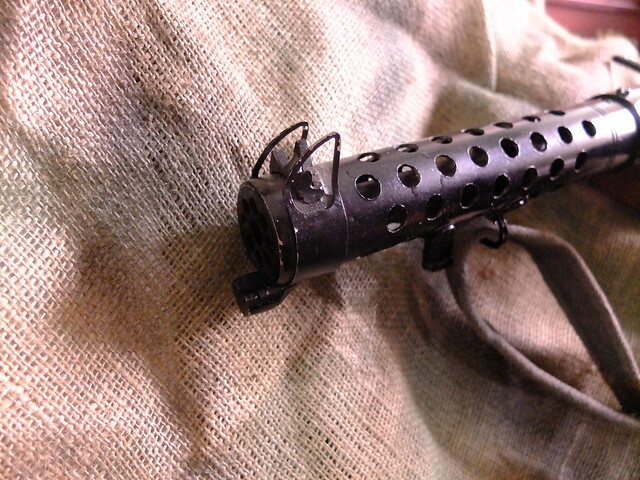 Collar at front of barrel shroud. Tangent rear sight. perpendicular mag well. Stick magazines. Tsing Tao: Chinese characters, vertical magazine well. It looks like they also produced direct copies of the MP28. 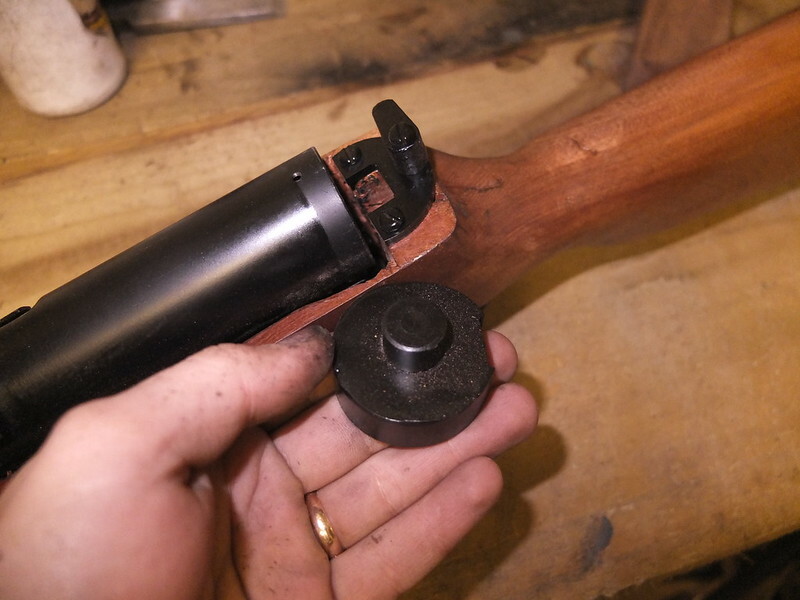 MP34: straight sides, magwell angled around the circumference of the receiver. Vented foresight guards. 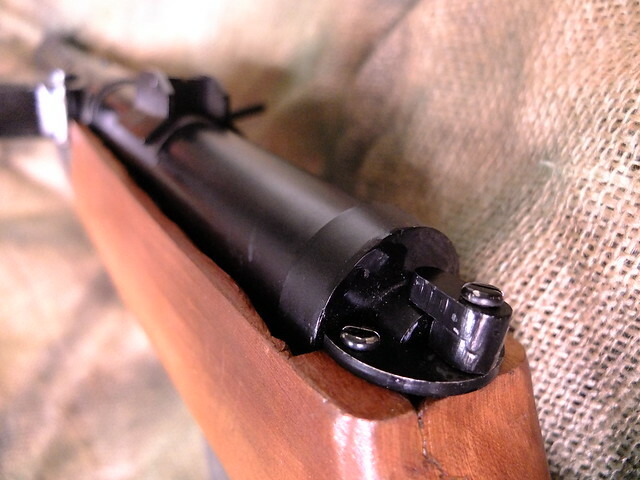 Bayonet lug on side. Adjustable rear tangent sight. 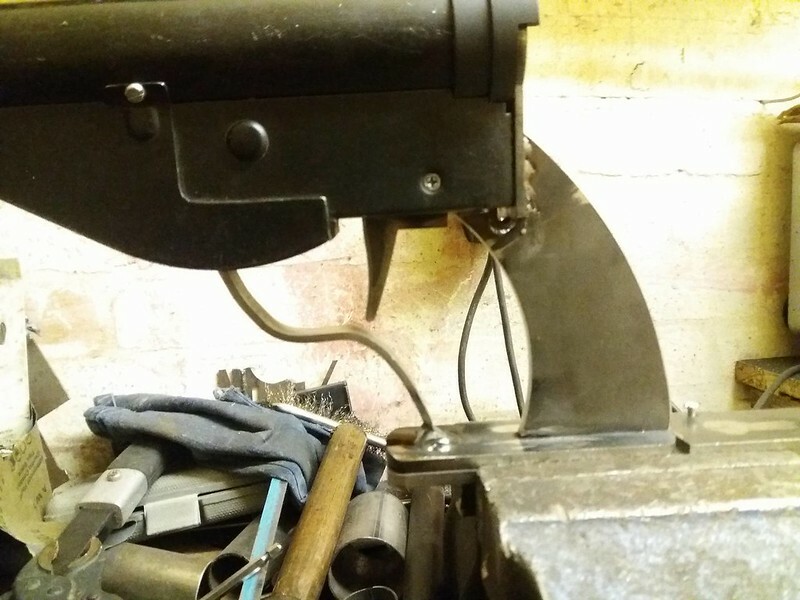 Hinge behind magazine well to lift top cover. Unusual as has magazine charger at 90 degrees built into the mag well. Lanchester MkI: Brass magazine well (though if still finished this may not be visible). 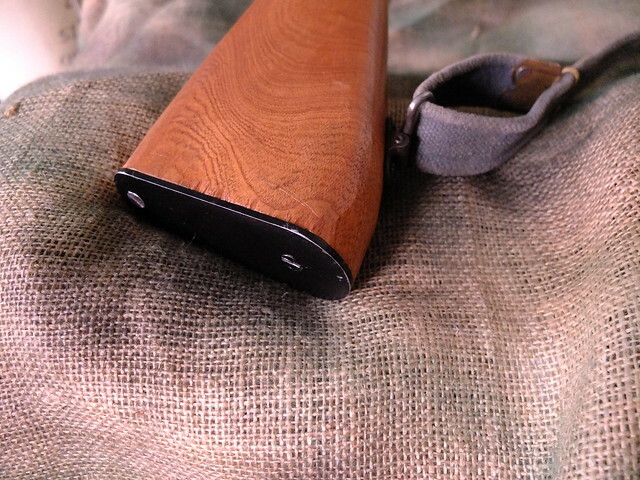 50 round magazine. Hooked op handle. 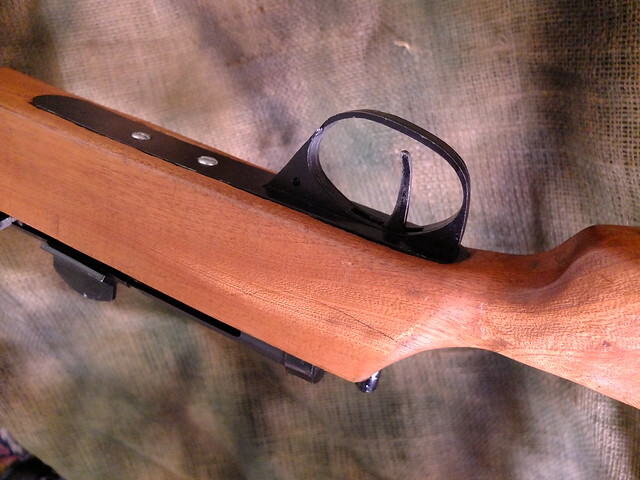 Vented front sight guards. Tangent rear sight. 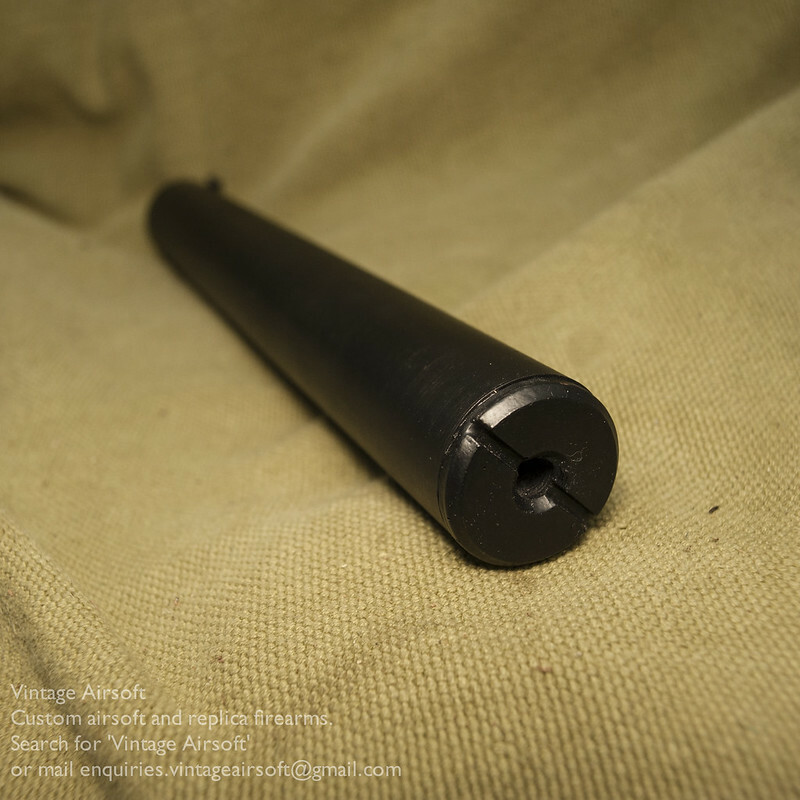 Bayonet lug for SMLE P07 bayonet. Stock similar in shape to a P14 Enfield. Lanchester MkI*: As MkI but straight op handle, fixed rear sight with two very large sight guards. 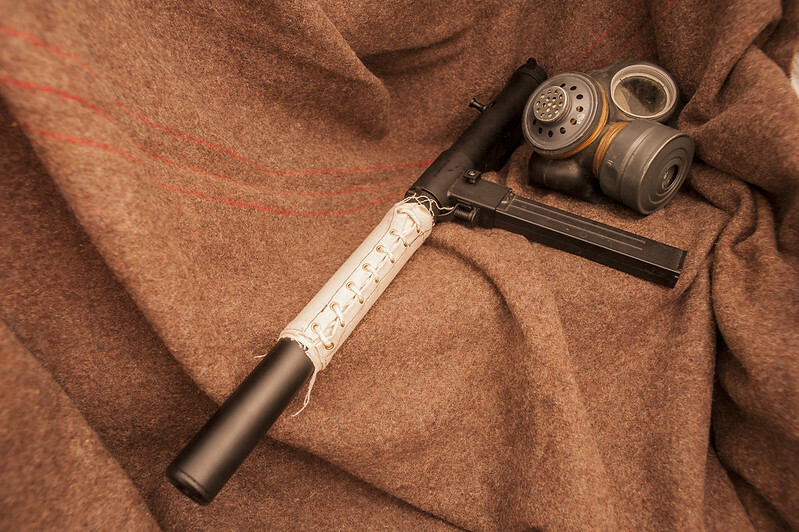 Bergmann MP35. You can take a look at the picture to ID this oddity. The majority of decedents from beyond this point (Stens, Sterlings etc…) are for another article really. This is a rough guide, due to their extensive re-use and circulation there will be variants on variants I am quite sure. I have tried to give you the best chance of identifying different models, sometimes using original and sometimes applying my own nomenclature to differentiate between models. 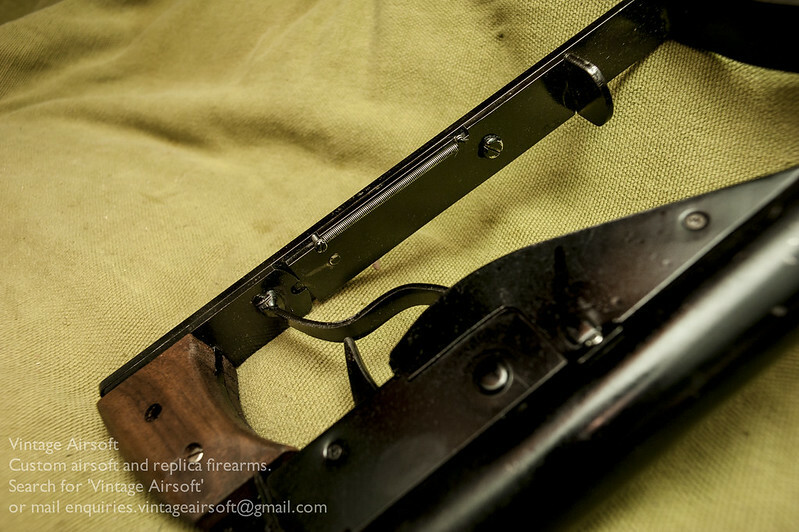 If you see anything that you can prove is incorrect with quality sources, please do get in touch on enquiries.vintageairsoft@gmail.com. 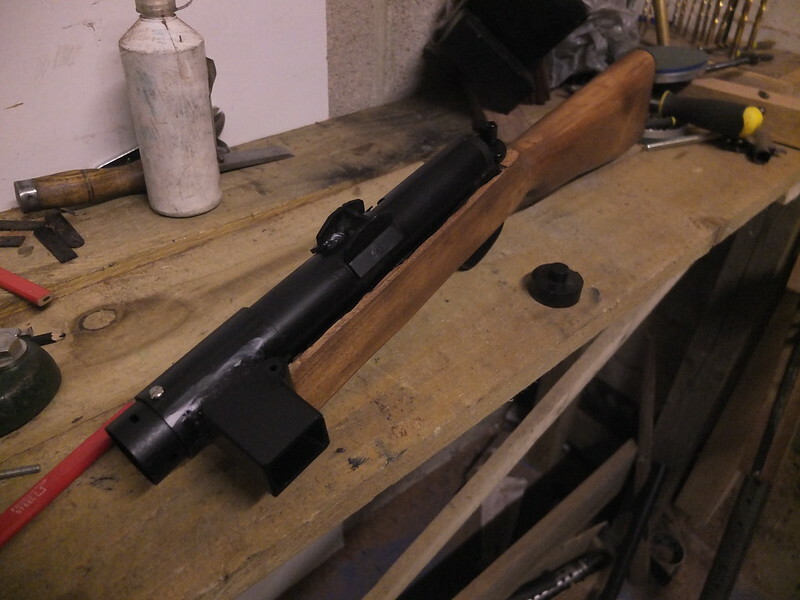 “I was first made aware of Vintage Airsoft’s MkV Sten kit through the WW2 Airsoft forums, perhaps better known to some as ‘Comrades in Arms’. Dom had posted his prototype MkV build, and was looking to put together some more kits for those of us stuck with the perhaps not-entirely-accurate MkII Sten, especially for the many folks like me that portray the iconic late-war British paratroopers! 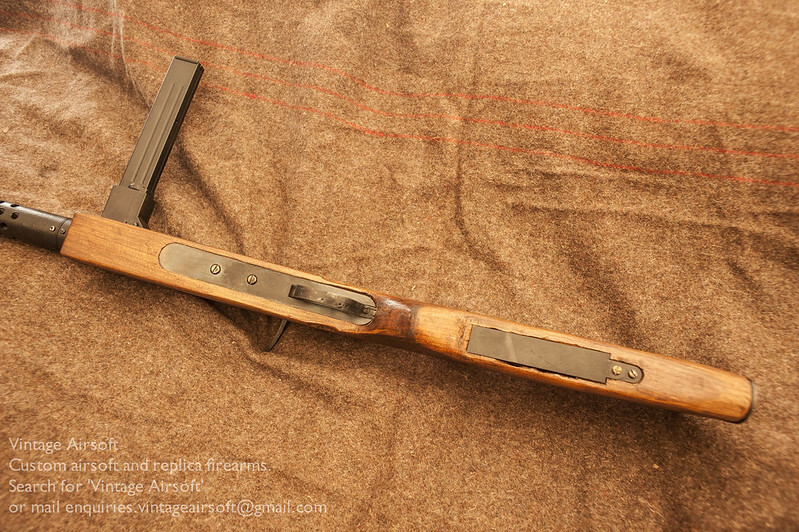 The idea was inspired: a hand-built, wooden stock, comprising a mounting bracket and pistol grip, that slotted directly onto the receiver of the AGM Sten, replacing the standard T-stock; the kit would be complete with a wooden foregrip that bolted to the Sten barrel shroud, and topped off with a metal front sight that slipped over the outer barrel. 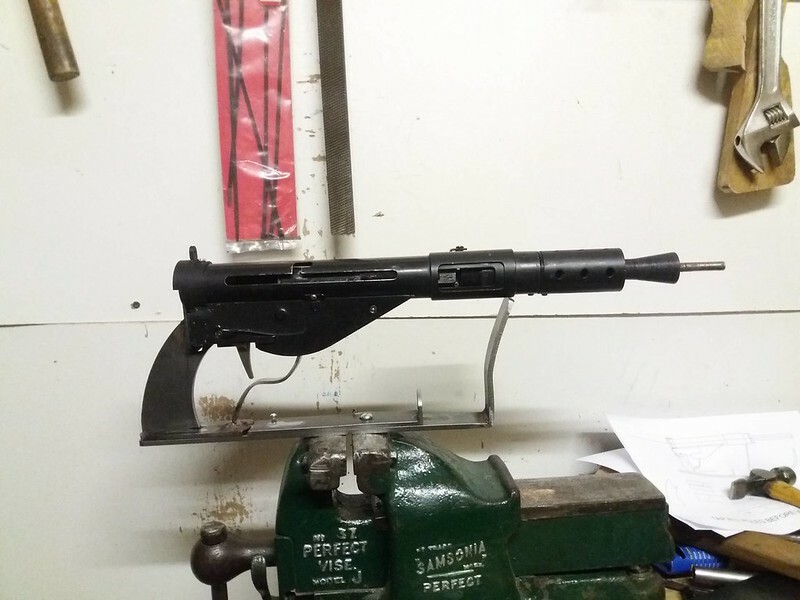 As if that wasn’t enough, the wooden stock was hollowed out and wired, meaning the Sten was no longer bound to tiny batteries. All of that for a fraction of the price of a full custom gun, and you could swap back to the old MkII components without any permanent modifications. I jumped at the chance, and I’m pleased to say after a solid year of near constant use in all weather, the kit has held up admirably. It’s been dropped, fell on, submerged in nasty bog water, and survived me crashing through foliage in full combat kit, with the only appreciable outcome being a slight looseness at the stock mounting (which was subsequently fixed with the liberal application of B&Q’s finest super glue). 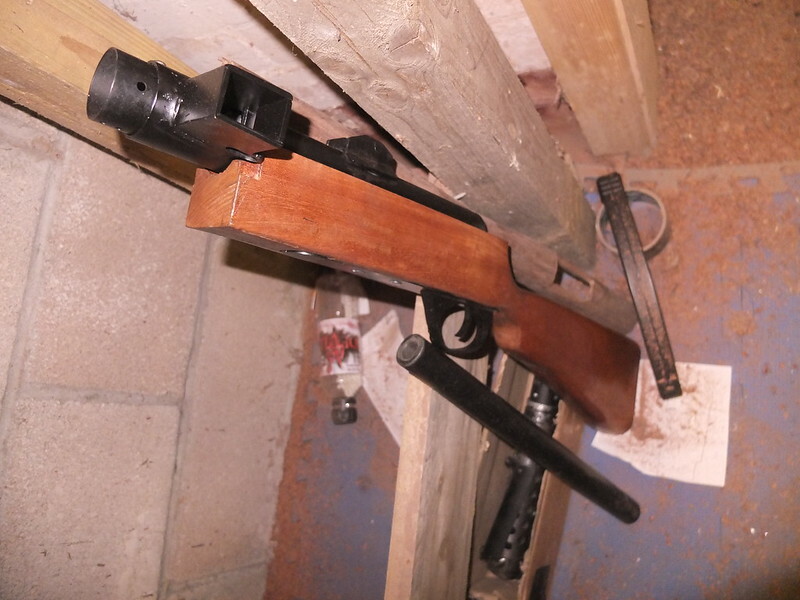 I’ve found it to be a very comfortable weapon to hold – a far cry from the plumber’s nightmare that was the MkII – and the battery compartment in the stock is truly a godsend; battery switches can be done in a flicker of the time, and without dismantling the gun to boot. 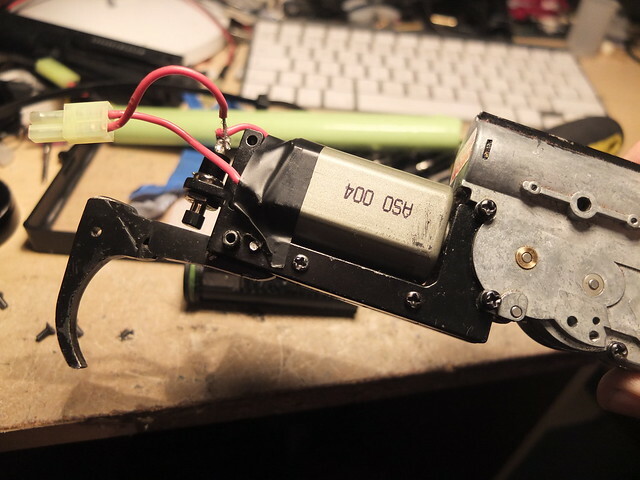 Now, being a drop-in kit, as it were, all of the pieces are obviously made to be easily installed or removed without modifications to the base gun, and there are some drawbacks to this. 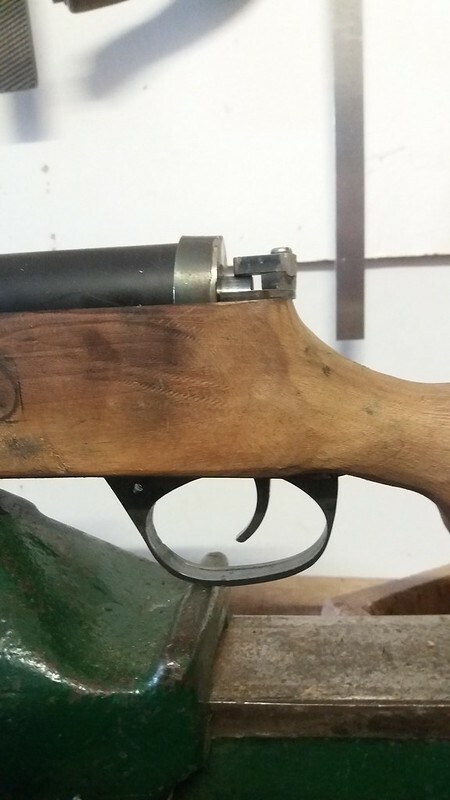 The front sight, for example, was initially held on by friction, meaning that knocks and bumps to the gun would frequently misalign it with the rear sight. 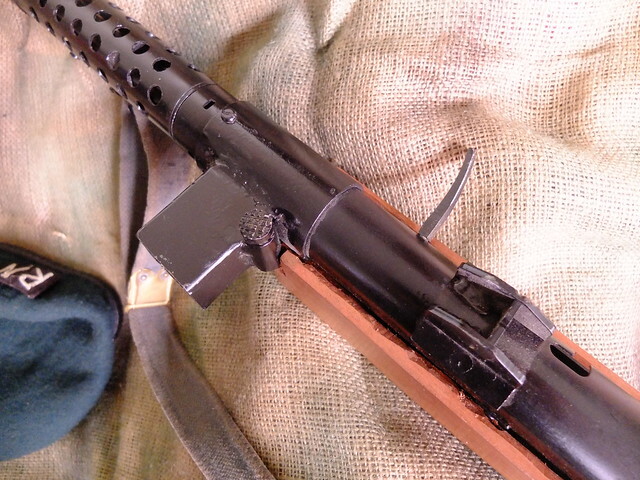 I also found that the paintwork of the metal band that fits around the barrel shroud would wear away very easily, due to the steel fitting of the sling rubbing against it with use. The nature of the kit also means that certain aspects of the real MkV cannot be replicated – the rear pistol grip sits further back, most tellingly, although this is a small price to pay in my opinion. 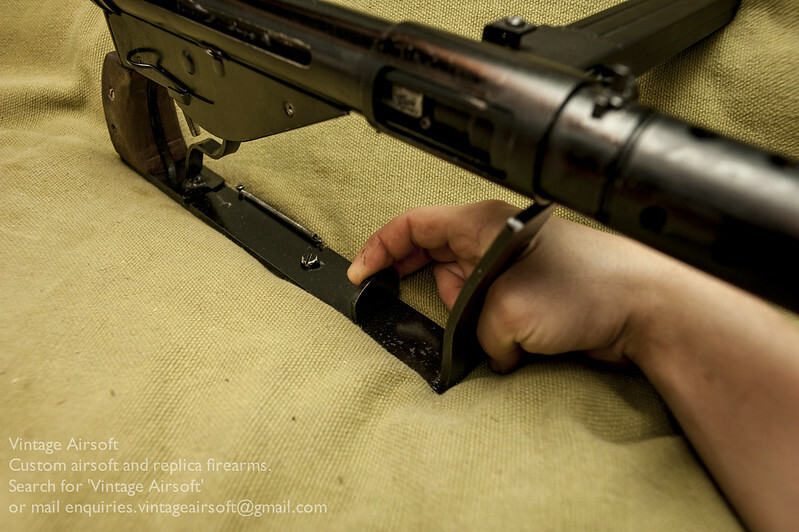 The front sight issue can be easily solved: boring and tapping a small hole through the underside, then using a pointed screw to tighten it against the outer barrel of the Sten would help immensely. 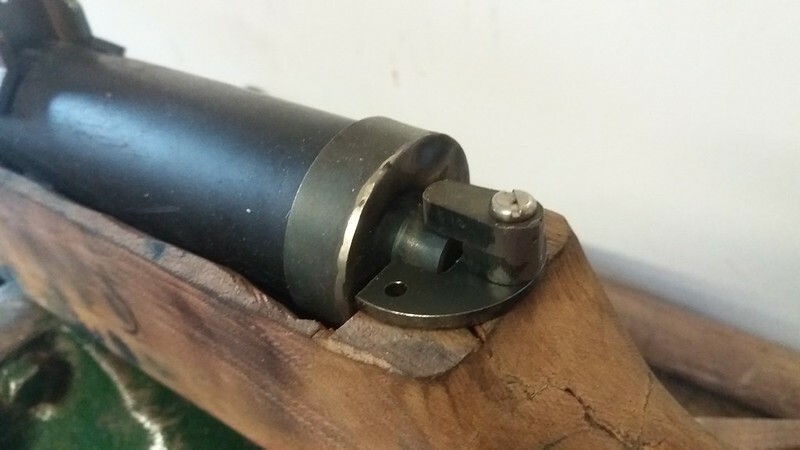 Indeed, the user could go one step further and drill a shallow hole into the outer barrel itself for the tip of the screw, which would eliminate the front sight shifting altogether, and with minimal modification to the base gun. The barrel band, meanwhile, I would most certainly improve by chemical or oil blacking, rather than painting. This will allow it to resist the worst of the wearing the sling attachment subjects it to, and means I won’t have to keep repainting the bloody thing! I have been let down by certain individuals in this line of work in the past – sometimes criminally so. I am very pleased to report that my experience with both individual and product in this case has been overwhelmingly positive. It’s safe to say I have put the MkV kit through its paces from day one, and it has rarely let me down, with Dom always on hand with troubleshooting should I need it. I have reproduced Kendo’s full review here, unedited for full disclosure! Feedback like this is really appreciated and we’ll be improving our product accordingly by oil blacking the foregrip band and tapping the foresight mounting. This sort of feedback can only be gained after the sort of heavy use Kendo has subjected it to! You can buy our Sten MkV kit and many other items from our Etsy store. A big thanks to Syfer Airsoft Photography for use of their fantastic photographs. Check out their page for great kit and action photos.